A decision by supermarket giant Tesco to open its third Oxford store on the site of a disused pub has sparked concern among neighbours and shopkeepers. Tesco has bought the boarded-up Friar pub in Marston Road, Marston, from restaurateur Clinton Pugh, who had previously planned to build shops and flats on the site. Mr Pugh declined to say how much he had sold the site for. Last night, Tesco spokesman Carol Lesley admitted an Express store had been mooted for the site. The news caused concern among neighbours and traders who said they were worried the store would eat into their trade and have a negative impact on the area. Marston Road resident Rebecca Teal said: "I'm absolutely gutted to hear they are building a store there. "The original plans Clinton Pugh had for the site were much better and gave something back to the area. "All this will do is add more money to the Tesco coffers." Kathleen Kirby, who lives a few doors down from the Friar in Marston Road, said: "I would like some competition for the food shops, but not right on our doorstep. "We are very loyal to Costcutter and if that goes because Tesco forces them out, then there will not be a post office in the area." Ms Lesley added: "We have only just got the site, but I can confirm we will be working up a proposal for it. "At this stage I would think we will be looking to develop an Express store on the site, which is the smallest type of store we have, aimed more at convenience shopping." Crotch Crescent resident Mick Haines delivered a 1,000-signature petition to Downing Street in August, 2006, to keep the post office open. He said: "We fought hard to keep the post office in Marston and we don't want to lose it because Tesco decides it wants to build a store here. "If they start undercutting Costcutter - which they can afford to do - then it will go out of business and we will lose a vital service." There has been a similar response from traders in the area, who now fear for their futures. Sandra Kerwood of Seasons Delicatessen in Cherwell Drive said: "It will probably have quite a big impact on me. "Small shops are being pushed out of another area and being taken over by multinational companies." Pakeerathan Sivanes-arajah, manager of Costcutter in Old Marston Road, said: "A new Tesco would destroy the local community in this area. "Whether it is Co-op or Costcutter, we are all going to suffer." However, Ms Lesley dismissed these claims. She said: "Shops like ours actually keep people in the area and can act as an anchor, with people linking shopping trips to other retailers. "Retail is always competitive and always will be. At the end of the day it is good for the consumer and it keeps prices competitive." Mr Pugh said he decided to sell the site to the supermarket chain after city council planners refused to back his plans for the site. He said: "With the economy being the way it is, I don't have the time or money to fight planning officers. "I've already spent more than £40,000 trying to get permission to develop the site of my Lemon Tree restaurant in Woodstock Road." I have been raising the issue of lighting on the Croft Road recreation ground at Marston, Oxford, since July last year, after collecting 670 signatures from concerned residents. These people said if lighting were to be put in the street sports site, on the same side as the cycle track, they would feel safer and more likely to cross the recreation ground, even in winter. I have brought this issue up at several area meetings, but to no avail - I was told each time that consultation would be needed. A council spokesman quoted costs of lights for the street sports site as follows - £30,000 for lights, £5,000 for cables, and £600 for annual maintenance. Cracked and crumbling pavements in an Oxford road have angered residents. People living in Nicholas Avenue, Marston, are frustrated pavements in surrounding roads have been resurfaced while they have had to make do with repairs. Ron Cooper, 78, who has lived in the road since 1955, said he was disgusted with the state of the pavements and is calling on the city council to act. Mr Cooper said: "This isn't a new thing, I've been going on to the council about this for the past 18 months. "The pavements are in such a bad condition along this road and nothing is being done. Everyone is pretty fed up that it's been allowed to get like this. "And to make matters worse, the council has repaired several other roads in this area, which I felt were not as bad, and we get told there isn't the funding for ours." Mr Cooper said temporary work to repair damaged areas carried out three weeks ago was "insulting". He added: "The time and money spent doing that could have been put towards permanent repairs to the road." Neighbour Diane Wakeley, 47, said she preferred to walk in the road rather than on the pavement. She said: "The pavements are absolutely awful along Nicholas Avenue. "Walking in the roads is safer than on the pavements, as there's less chance of injuring yourself. "I just don't understand why they have spent money improving other streets around here and not spent it on ours." The Oxford Mail reported in September last year that the city council was facing a backlog of repairs to roads, verges and pavements, bec- ause of a lack of funding. Campaigner Mick Haines has backed residents' calls for improvements. He said: "This road is an absolute abomination and desperately needs work to improve the state of the pavements. 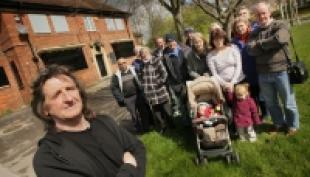 "It's just another example of Marston being neglected by the city council. If it were a street in Blackbird Leys or Barton, then it would already be done." Jean Fooks, the council's executive member for a cleaner city, said a bid for work on the pavement in Nicholas Avenue had been submitted to Oxfordshire County Council, which pays for the upkeep of the road. She added: "Any recent repair work has been carried out as part of our routine maintenance schedule. "If anyone has particular concerns about any areas of pavement, please contact us on 01865 252900 and we will inspect it."